Pictured in the rear, from left, students Catie McKenna, Sarah Quinones, Paige Haines, Maryellen Kelly, Macalagh McNally, Jessica Celzo, Agnes Palmer, and in front, from left, Harry Kelly and Sarah Sweeney. 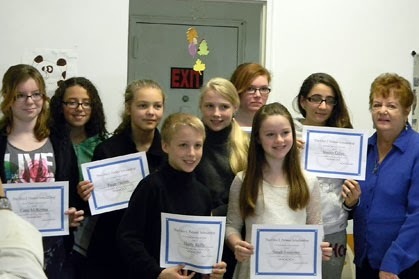 The Orio J. Palmer Foundation, a non-profit organization spearheaded by the Bronx-based Cara Art Studio, awarded eight scholarships on November 2 to aspiring young artists living in the Irish community of Woodlawn. The foundation, in memory of FDNY Battalion Chief Orio J. Palmer who was killed on 9/11, is also in recognition of his mother, Agnes Palmer, who started taking art classes at the studio shortly after her son died. Through art, Palmer learned to deal with the profound loss she was suffering and was eventually able to express her feelings and immortalize her son’s memory and that of several other lost firefighters in a series of portraits she painted for their families. All of them are currently on display in various fire houses across the city. “Today, a little over a decade ago, Mrs. Palmer still takes art classes at the studio, and although she has created other works of art, the role that art played in her life after 9/11 cannot be underestimated,” said the studio’s owner, Regina Farrell. Last year, Farrell created the foundation in response to calls from families in need of financial help due to the economic downturn. “Cutbacks were creating financial burdens on families who wanted their children to have access to enrichment opportunities, but could not afford them,” explained Farrell, adding that many of them are first-generation Irish immigrants who gain their livelihood from the construction trade, in addition to employees of local fire and police departments. The foundation has provided a total of 16 scholarships to local children this year. The Orio J. Palmer Foundation is a non-profit group dedicated to providing scholarships for children and teen art programs at Cara Art Studio in the Woodlawn section of New York City. For more information or to donate to the foundation’s ongoing scholarship fund, email thepalmerfoundation@gmail.com or visit www.caraartstudio.com.